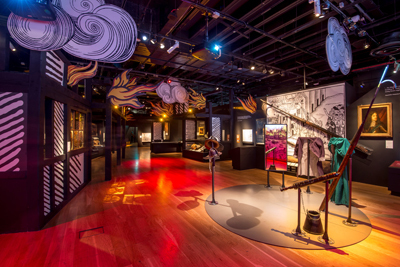 • A new “theatrical” exhibition marking the 350th anniversary of the Great Fire of London is opening at the Museum of London on Saturday. Fire! Fire! takes visitors on an interactive journey from before, during and after the great fire, looking at how the fire started and spread and the personal stories of Londoners present at the time. Visitors will be able to step in Pudding Lane and see what life was like for 17th century Londoners, walk into the bakery where the fire started, and identify objects melted by the flames. 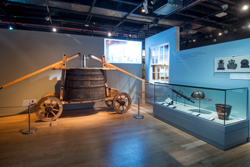 Exhibits on show include a restored 17th century fire engine, originally built in London in the last 1670s, other firefighting equipment including a squirt, a leather bucket and fire hook, a pair of bed hangings, a burnt Geneva Bible, and letters written in the fire’s aftermath. Admission charges apply. Can be seen until 17th April next year. 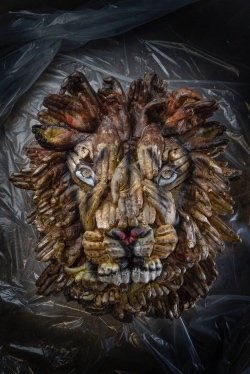 A series of events, including walks, tours, lectures, workshop and family activities, accompanies the exhibition. For more, see www.museumoflondon.org.uk/fire-fire. The museum has also commissioned a Minecraft building group recreate London as it was in 1666 with the first of three interactive maps to be released next week (available for free download from www.museumoflondon.org.uk) and further maps to follow in September and February. For more information on other events surrounding the anniversary, see www.visitlondon.com/greatfire350. • The long lost Palace of Whitehall is the subject of a new visitor experience which kicks off at the last surviving part of the palace – the Banqueting House – today. Handheld devices, binaural 3D sound and haptic technology is being made available to guests as they stroll around the streets of modern Whitehall, allowing them to immerse themselves in the former palace during the time of the Tudors and the Stuarts. The Lost Palace experience, created in a collaboration between Historic Royal Palaces and Chomko & Rosier and Uninvited Guests, includes a chance to see the jousts which so delighted Queen Elizabeth I at Horse Guards Parade, accompany King Charles I as he walks through St James’s Park to his execution at the Banqueting House, meet Guy Fawkes following his arrest in the Gunpowder Plot, take part in a performance of King Lear and eavesdrop on an encounter between King Henry VIII and Anne Boleyn before their doomed love affair began. The Palace of Whitehall was once the largest palace in Europe with 1,500 rooms spread across 23 acres. Tickets can be purchased at the Banqueting House. Runs until 4th September. For more details, see www.hrp.org.uk/thelostpalace. • Dresses worn by Queen Elizabeth II during two of the most significant events in Her Majesty’s life – her wedding and her coronation – can be seen as part of the Summer Opening of the State Rooms at Buckingham Palace from Saturday. The two dresses will form part of a special exhibition – Fashioning a Reign: 90 Years of Style from The Queen’s Wardrobe, the largest display of the Queen’s dress ever held. Alongside the two feature dresses, both designed by British couturier Sir Norman Hartnell, are around 150 outfits created by designers including Hartnell, Hardy Amies and Ian Thomas. 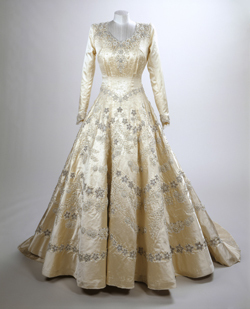 The then Princess Elizabeth’s wedding dress (pictured), made for her marriage to the Duke of Edinburgh on 20th November, 1947, was made in ivory silk, decorated with crystals and 10,000 seed pearls and attached to a 15 foot long train, while the Queen’s Coronation dress – created for the event on 2nd June, 1953, is made of white duchesse satin and encrusted with seed pearls, sequins and crystals (along with an extra four-leaf shamrock on the left side of the skirt, added secretly by Sir Norman, to bring her good luck). The exhibition, open to 2nd October, is being accompanied by special displays at both Windsor Castle and Holyroodhouse in Edinburgh. Admission charges apply. For more, see www.royalcollection.org.uk. PICTURE: Royal Collection Trust/© Her Majesty Queen Elizabeth II 2016. • The world’s largest collection of London images – more than 250,000, dating from 1450 to now – are being made available on a free-to-access website hosted by the London Metropolitan Archives from today. Collage – The London Picture Archive features more than 8,000 historical photographs of capital’s streets as well as images of the Great Fire of London in 1666 and photographs of the construction of Tower Bridge along with maps, prints, paintings and films, all drawn from the collections at the City of London Corporation’s Guildhall Art Gallery and the Clerkenwell-based London Metropolitan Archives. The collection can be accessed at www.collage.cityoflondon.gov.uk. • It’s hands-on gaming at the Science Museum for two weeks from Friday with more than 160 systems and hundreds of games available to play on. Power UP spans 40 years of gaming with games ranging from classics like Pong and Pac-Man to modern games like Halo and systems from Atari and SEGA to PS4 and Xbox One. Ninety minute sessions are being held four times daily from 11am tomorrow until 7th August. Ticket charges apply. For more , see www.sciencemuseum.org.uk/powerup.